More than seven years now since the introduction of novel oral anticoagulant (NOAC) drugs like Pradaxa, Xarelto and Eliquis, experts are still debating their safety relative to warfarin, the drug they were meant to replace. Yet, despite the billions in sales for these medications, one thing can’t be debated: tens of thousands of patients have already been hospitalized or killed from internal bleeding after taking them. Now, with new data out on the safety of popular blood thinners and litigation in full swing over internal bleeding injuries, DrugNews offers the latest updates. Two new studies released this year sought to compare the safety and effectiveness of the leading blood thinning drugs. However, the results differed significantly. First, the British Medical Journal in February published a nationwide study of more than 55,000 patients in Denmark taking one of the four major blood thinners for atrial fibrillation: Pradaxa, Xarelto, Eliquis or warfarin. Results showed that during the first year of treatment, 4.78% of patients taking Eliquis suffered a stroke or blood clot, compared with 3.74% for warfarin, 3.53% for Xarelto and 3.31% for those taking Pradaxa. After two and a half years, those stroke and blood clot occurrences dropped to 3.98% for Eliquis patients, 2.73% for Pradaxa, 2.72% for Xarelto and 2.68% for warfarin patients. Internal bleeding risks were slightly higher, with 5.6% of Xarelto patients suffering a bleeding injury, compared to 5.1% of those taking Eliquis, 5.1% taking warfarin and 4.1% of those taking Pradaxa. Then, in March, a similar study of Medicare patients in the United States was released at the annual American College of Cardiology meeting. Here, patients taking Eliquis had a significantly lower risk of both stroke and internal bleeding compared to warfarin. Xarelto patients had a lower risk of stroke than those taking warfarin, but had substantially higher risks of internal bleeding. Pradaxa patients, meanwhile, showed similar risks of stroke as those taking warfarin, but significantly lower rates of bleeding. In sum, Pradaxa scored best in Europe, while Eliquis was rated as the safest alternative in the United States. 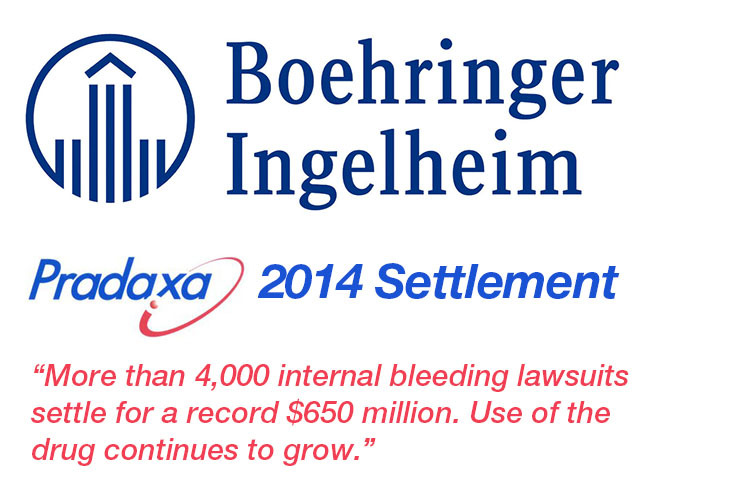 With the 2014 settlement of more than 4,000 patient internal bleeding lawsuits for a record $650 million, many wondered if the use of Boehringer Ingelheim’s Pradaxa would fall by the wayside. However, use of the drug continues to grow. In 2015, Boehringer finally introduced an antidote designed to stop bleeding in cases of emergency, much like the vitamin K injections used for warfarin patients. However, many question whether it is as effective as warfarin’s antidote, since thousands more continue to suffer hospitalization or death. Now, to help those victims not included in the 2014 settlement, lawyers have begun a new round of Pradaxa bleeding lawsuits. Cases have been filed in various consolidated state courts including Connecticut, Missouri and California. And, although trials are scheduled to start in late 2017 or early 2018, with over 6,000 new cases filed so far the manufacturer is under immense pressure to reach a second settlement. Xarelto was released shortly after Pradaxa, but has grown into the market leader amongst the warfarin alternative blood thinners. Unfortunately, it has also logged the most FDA complaints for brain hemorrhage, gastrointestinal bleeding, bleeding death and other internal bleeding emergencies. Already, more than 17,000 people have filed lawsuits alleging Xarelto caused severe bleeding resulting in hospitalization or death. So many, in fact, that the Judicial Panel on Multidistrict Litigation had to consolidate all cases to a special federal court for easier handling. Trials began in April for a select number of bellwether, or test cases, to determine how to handle future claims. The first, a case selected by Xarelto’s manufacturer for its favorable facts, was decided in favor of the drug maker. A second case in May, also reported to have circumstances supporting the drug’s maker, was decided in favor of Bayer and Johnson & Johnson. Now, however, lawyers are focusing their full efforts on the two upcoming cases with the intent on shifting the tide back in favor of the victims. One thing is for sure: the Xarelto litigation is far from over and lawyers are urging those injured to continue to seek justice. Eliquis, a medication made jointly by Pfizer and Bristol-Myers Squibb, was the last to be approved by the FDA in 2012. However, it has steadily grown in popularity since, with claims from its makers that it is the safest of the anticoagulant alternatives. However, the FDA recently denied attempts by the drug’s makers to release a bleeding antidote, calling into question safety concerns with the manufacturing process. And, unsealed court documents question whether Pfizer and BMS hid some of the bleeding dangers of Eliquis from researchers and the FDA during the approval process. A growing number of patients and families have filed lawsuits claiming Eliquis caused hospitalization or death from severe internal bleeding. Many of the cases have been consolidated to Multidistrict Litigation number 2754 in the Southern Federal District of New York, under Judge Denise Cote. However, cases will also be filed in various state courts fro several victims. Lawyers are continuing to file new Eliquis lawsuits, and urge anyone affected to learn about their legal options. For more information on any of the latest research surrounding blood thinner medications, or to speak directly with a lawyer about the ongoing Xarelto, Pradaxa and Eliquis litigation, contact DrugNews today.